Over the last decade, we’ve seen Downtown transform into something trendier than its former self (we even have a new gimmicky skyscraper glass slide! ), so it’s sometimes hard to think back to a simpler time -- almost a century ago -- when the area was just full of mom-and-pop shops. What’s even harder to imagine is that in the neighborhood, for nearly that long there’s been a beef jerky factory operating right under our noses for a good chunk of the last century -- and meticulously run by four generations of fathers and sons. 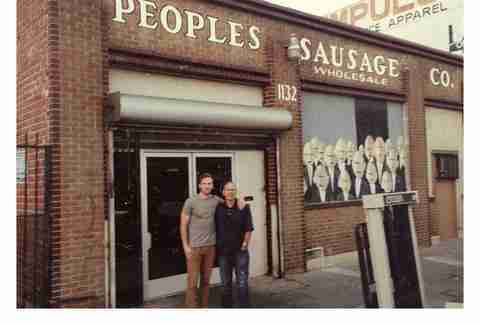 In an industrial part of Pico Blvd, near Downtown’s Fashion District, is a one-story, brick-lined building emblazoned with the words, “Peoples Sausage Co.” and covered with a mural of bespectacled men in blue business suits. Although the sign bearing the old company name hasn’t been changed out of tradition, the business is now more familiarly known as “People’s Choice Beef Jerky.” And yes, this is where all the sweet beef-jerky-making magic takes place. While you can find People’s Choice Beef Jerky products at gas stations and online, or even in private labels for supermarkets, what gives the company that je ne sais quoi is that on any given day, you might see a loyal customer ringing the doorbell to the building and getting a chance to purchase single fresh pouches of handmade beef jerky -- from traditional hot and spicy or teriyaki, to newer ones such as Sriracha or garlic ginger -- direct from the employees. This all happens while an album like AC/DC’s “Back in Black” is blasting in the background. It’s this old-school, family feel that has kept this small company in business for 87 years. 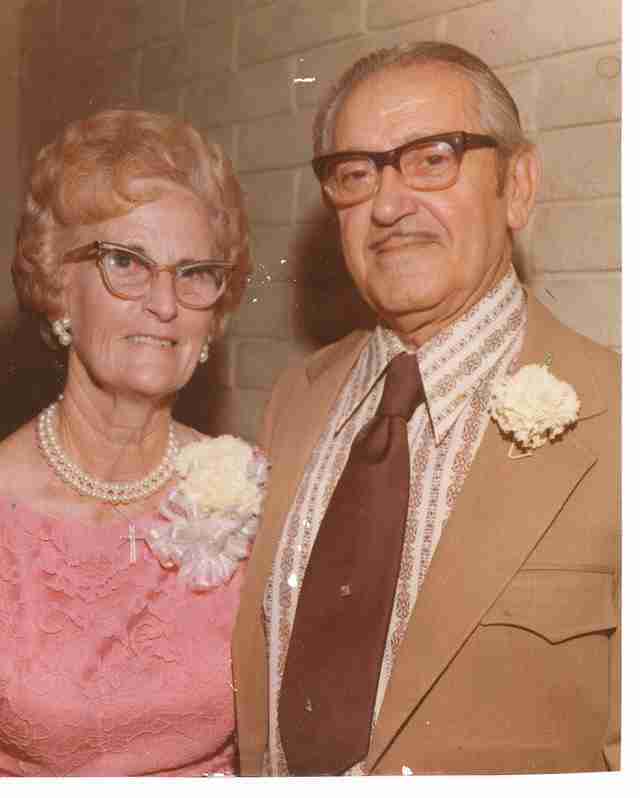 In 1929, when John Bianchetti was just 18 years old, he founded a meat shop called “Peoples Old Market” on San Pedro St with the help of his sister. Ten years later, he moved the facility over to Pico Blvd, where the business still operates today. “The whole landscape of the area was very different (then),” Brian Bianchetti, the 28-year-old, fourth-generation owner of the company says. He and his father, 60-year-old Mark Bianchetti (and third-generation owner), researched old records in Downtown’s Central Library to learn more about the history of their family business. They found from an old schematic that Peoples Old Market was situated in the middle of a rather residential area, and served as the neighborhood butcher shop. Nowadays, the houses are gone and replaced with industrial businesses. 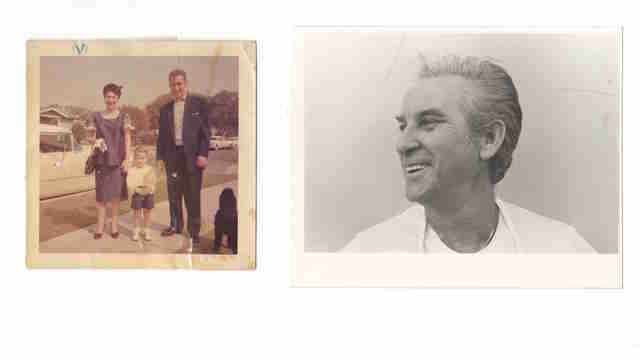 It wasn’t until 1955 that John Bianchetti’s son Paul, who returned to LA after serving in the Korean War, would join his father and work side by side with him for years. When Paul Bianchetti, the second-generation owner, took over the reins, he moved the business towards supplying restaurants with meat. 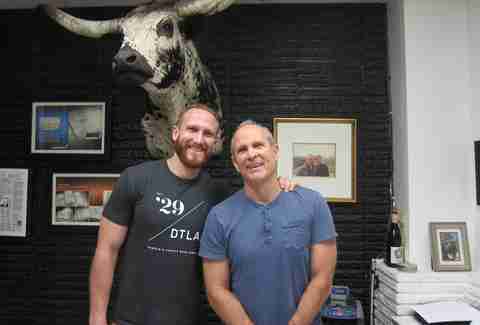 What has been constant is that Mark Bianchetti remembers that his family always made beef jerky ever since his grandfather, John, moved the factory to their Pico Blvd location in 1939. “I remember as a kid I could see him cutting it and drying it and doing all that good stuff,” he says. 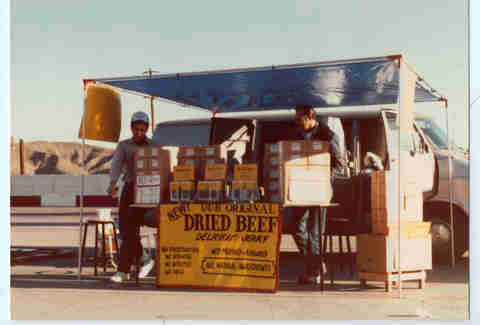 Like his father, he took the business into another direction, one that was almost entirely focused on beef jerky. “The one thing I realized that we were making that was unique was the beef jerky, in the sense that we have a product that we manufacture here and if you want our style, our flavor profile, our product, [then] you have to get it here,” Mark Bianchetti says. He came up with the idea of selling large slabs of beef jerky, the kind that you can find in plexiglass containers at gas stations. It took off and became the bread and butter -- so to speak -- of the company business. Mark Bianchetti never pressured his son Brian to follow in his footsteps. “They always encouraged me to have my own experiences,” Brian says of his parents. 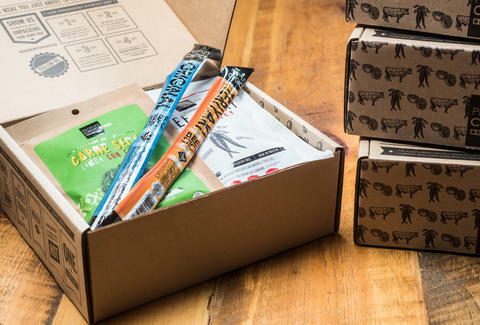 After graduating college, Brian went on to work at an advertising agency in Chicago before returning home to join People’s Choice Beef Jerky about three years ago. Since Brian’s entrance to the company, he’s ramped up the advertising and marketing of People’s Choice Beef Jerky, something that was never really formally done until now. Brian updated the packaging and now tinkers around with the spices and marinades for the jerky varieties. Previously, the family only sold standard traditional flavors, but now he’s developed other ones -- like a Carne Seca line with Latin spices, and limited-edition styles like orange-honey teriyaki, sweet-chili habanero, and a holiday maple brown sugar. Although the traditional flavors are still the company’s best sellers, the new ones have opened their business up to entering more “artisanal” markets. The Bianchetti way of making jerky is a simple one that has pretty much stayed the same since the early days of the company. It’s still a mostly handmade process. The meat gets trimmed by hand and then sliced through a machine to get a uniform thickness of strips. The pieces of meat are marinated in spices inside of a vacuum tumbler, which pulls all the air out of the vat so that the marinade and spices can penetrate the flesh faster. Then workers lay out each strip of marinated meat on stainless-steel screens before the screens get put into push trucks that end up in ovens. The meat takes two-and-a-half to five hours to cook, depending on the thickness of the cut. While it cooks at 170 degrees Fahrenheit, the low heat also slowly dehydrates the meat, which causes the beef jerky to have low moisture and be shelf stable. It’s then air dried before it gets hand-packaged in boxes and pouches, and sealed by machinery. And in case you’ve ever wondered why beef jerky is so expensive, it’s because 10lbs of beef ends up becoming 3lbs of product by the end because you’re taking all the moisture out of it, according to Mark Bianchetti. It isn’t just the family who’s been in the business for what seems like an eternity. At least four employees there have been there for close to 20 years. It’s not to say that nobody leaves, but for being a small company that currently employs 20 people, the ones who do stay are there for a long time. Ramon Gonzalez, the plant manager, has been at People’s Choice for 16 years, and has worked with three generations of Bianchettis. He’s known Mark Bianchetti for even longer, around 30 years, when he previously worked at another company in Vernon -- which just so happened to be owned by a friend of Mark Bianchetti’s. Jose Soto, the factory’s production manager, has been there even longer, at 25 years. He speaks in Spanish as Brian Bianchetti translates. 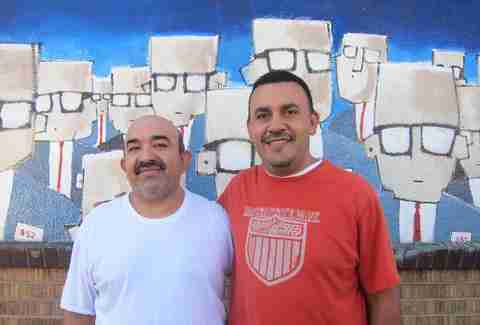 What’s been keeping Soto here for so long is that he’s worked with three generations of Bianchettis and the people he works with are like family to him. If there’s something everyone can agree on, it’s that the late Paul Bianchetti was a “character,” a common phrase his family and employees all use. “If he was nice to you, he hated you; if he was mean to you, then he loved you,” Gonzalez says, while laughing. On the other end of the spectrum, John Bianchetti, the first-generation owner, was gentle and soft spoken, and also a family man. Mark Bianchetti remembers that when he was growing up, he lived just a block away from his grandfather house. Every Friday, it was a tradition for the family to visit his grandparents and watch TV with them and chat. Despite the challenges, Mark Bianchetti says that he loved getting to spend time with his father, where they worked together for over 20 years, and for most of that time, even drove to work together. Brian Bianchetti feels that same way, too. “Being back here now for the past few years and working side by side with my dad and being in this environment, I’ve realized the power of being part of something larger than yourself, in the sense [of being] the fourth generation and [having this history of] all these years and what we do,” he says. “I find I get a lot of value from that, a lot of meaning.” And a lot of jerky. Jean Trinh is a Thrillist contributor who can eat her weight in beef jerky. Follow her on Twitter and Instagram.